Dublin-based Kildare man Damien Rice has just released his long awaited debut album, entitled "O". The young man from Celbridge has been working on the album for almost two years, and its release was greeted with enthusiasm and relief from a growing fan base who must have wondered if they were ever going to hear it. t had become something of a joke at live gigs over the past year and a half when Damien Rice would assure the audience that the album was nearly finished. Indeed, in early 2001 there was even an "Album Completion Celebration Gig" in the Temple Bar Music Centre. And so when the release date of February 1st was announced it was met with a cautious enthusiasm. After all, Damien's delaying perfectionism aside, his debut single, The Blower's Daughter, was set back a week when the boat shipping it from Britain caught fire. Twice. But everything this time has gone mostly according to plan. Damien and his band played a launch gig in Vicar Street on January 31st at which the album was sold and the following day it was available in most record stores. The availability did not last long however; in a testament to Damien's talent and popularity the album sold out within a few hours. But of course good sales tell us nothing of a record's real worth. Just look at Westlife. So what's the album actually like? Well, to be honest, amazing. 'O' has been a long time in the making by any standards, and has quite an unconventional genesis, with tracks included on it recorded in, among other places, Paris, London and, er, Celdbridge. It also features on one track - Amie - an overwhelming string arrangement written and arranged by the renowned composer David Arnold (who has worked with Bjork among others) and performed by members of the London Symphony Orchestra. Damien shares a lot with the likes of David Kitt, the late Mic Christopher and David Grey, yet at the same time he rises above them all, sets his own standards and makes his own rules. A lot has already been said when talking about Damien Rice and BellX1, another Kildare group, concerning their common origins as the band Juniper. Shortly after Rice left Juniper over "musical differences" Juniper renamed themselves Bell X1 and released their debut album Neither Am I (check out the review). With the release of 'O', those musical differences are obvious and so profound that one wonders how Juniper existed at all. While 'Neither Am I' is a standard, though competent and enjoyable, indie rock album, 'O' is a mellow, emotion charged, lilting and - at times - spiritual offering. The difference is highlighted starkly by the track 'Volcano', a song shared by both albums. On 'O' Damien opts for a softer approach than BellX1 and makes use of a fantastic cello and the haunting vocals of Lisa Hannigan, who is featured throughout the album. The cello, provided by Vyvienne Long, is just one example of Damien's attempts to break away from a conventional instrumental formula of guitar, bass and drums. He also features the famous French pianist Jean Meunier, the orchestral string arrangement previously mentioned, and a powerful opera singer named Doreen Curran who sings the last verse of Eskimo in Intuit. He makes use of several inventive special effects such as the children in the background of 'Older Chests' (he simply stood outside St. Brigid's primary school on the main street of Celbridge with a microphone in his hand and recorded them as they left school laughing and playing) or the ultimate special guest, the voice of God, which guests on 'Cold Water' (the Gregorian chant-style God was influenced by the monks of an abbey in the south of France where Damien spent some time). Considering the above, he could be accused of trying too hard and of over-producing the album and making a mess of things. But no, it all works well and fits together excellently. Damien wanted to release this album without the backing of a major record company, fearing that if he signed to them before he had proven himself they would begin dictating to him and forcing him in a direction he didn't want to go. He hoped that with the release of 'O' he would be in a position where the only thing dictating direction would be the songs. And he already is. 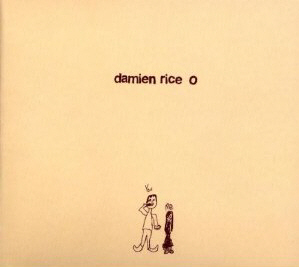 To buy a copy of Damien Rice's album 'O' on Amazon just click here.